Kevin Smith: Tracy Morgan is a "Genius Acting Crazy"
Kevin Smith got to know comedian Tracy Morgan very well working on their buddy cop movie "Cop Out" with Bruce Willis. PopcornBiz needed an instant personality analysis of one of the most intriguing, and off-the-wall figures making us laugh today. His diagnosis? Smith believes that while Morgan might act a little bit crazy, but there's very much a method to the madness. "I think he's a genius acting crazy," Smith tells PopcornBiz. "He knows what he's doing. I would say he's no (expletive) dummy and it's not luck that he is where he is today." With "Cop Out" arriving on Blu-Ray and DVD on July 20, Smith talked about Morgan's on-set behavior, which never was as extreme as the "Tracy Jordan" antics from "30 Rock." But there was a Morgan entourage on-set. 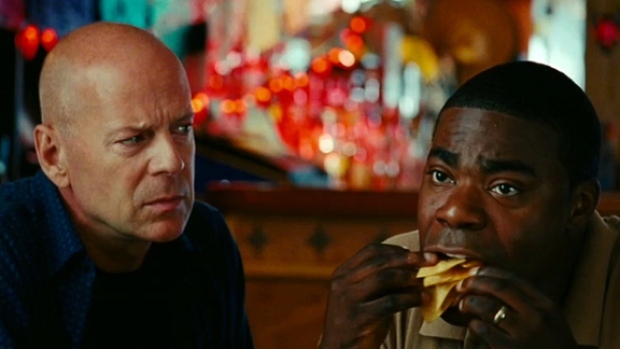 Check Out the Trailer for "Cop Out"
Bruce Willis and Tracy Morgan are a couple of wacky cops fighting crime in Kevin Smith's new comedy. "Does he have people around him? Yeah," says Smith. "Does he have people like Griz and Dotcom (from "30 Rock")? No. They are not catering to his every need." Instead Morgan's posse provided comedy inspiration for the star. At times, members of the group would provide feedback to Morgan on how to make a scene funnier. Or else they just served as a comedy sounding board to find the funny in a scene. "At first I was like, "Tracy what are they doing?' " Smith recalls. " And he'd be like, 'They're just here to be funny with.' And you start to get it. " "Just having them around gets his comedy juices flowing," says Smith. "You're just funnier around certain people. Tracy is smart enough to know that he's not going to get many shots to co-lead a movie with the likes of Bruce Willis. He was coming over-packed and over-prepared." But most importantly, Smith admired at how free and easy Morgan really is. It's not just an act. "Tracy reminds me very much of a little kid," says Smith. "I'd like to consider myself a free person, but Tracy Morgan puts us all to shame." You can see that just by the way the comedian shows off his growing gut to the folks on set and the world. "He's the kind of guy who will take his shirt off and work the gut even more than it is," says Smith. "He doesn't have a huge gut, but he leans into it. He'll put it on a chair."